I love eggs. But I only like scrambled eggs. I don’t like them any other way. NO OTHER WAY. Not fried, not hard boiled, not soft boiled, not poached, nothing! My hubby likes them different ways. He even likes hard boiled eggs. He is famous for his deviled eggs. One reason he is famous for his deviled eggs is that he has been working to perfect them. Ya know . . . he has worked to find a way to make them come out really well. A while back I had heard about people baking the eggs INSTEAD of boiling them. 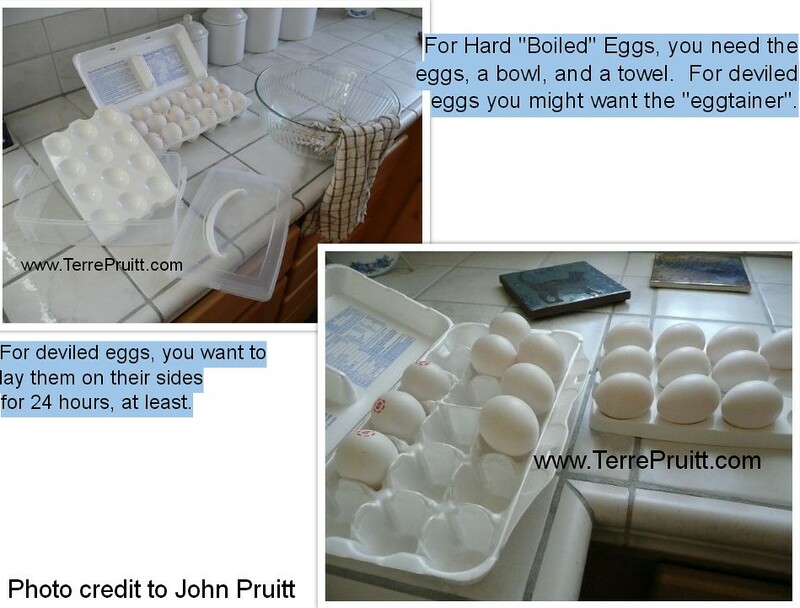 For years I kept saying, “I’m gonna try that.” I had a friend, my chef friend I often mention on my blog, who did an experiment on hard “boiled” eggs. I forgot exactly all that she did, but baking them was included in the test. She concluded that baking them didn’t make them easier to peel. This encouraged me to put off trying the baking method. Then one day my husband came home with a new idea, he was going to bake his eggs. <sigh> Then, HE never did. But he, like me, kept saying he was going to. One day I just threw some eggs in the oven. I used a muffin tin . . . but you might know from Muffin Tin Eggs post that I don’t have a TIN, I have the silicone kind. It worked. My husband liked them. And that is all it took. Sometimes it just takes someone . . . even if it is not you . . . to take the first step. After I made them in the oven and they came out well and my husband liked them, he decided to try it. But his method is a little different. I asked him to take pictures for me so that I could post about it on my blog for you. 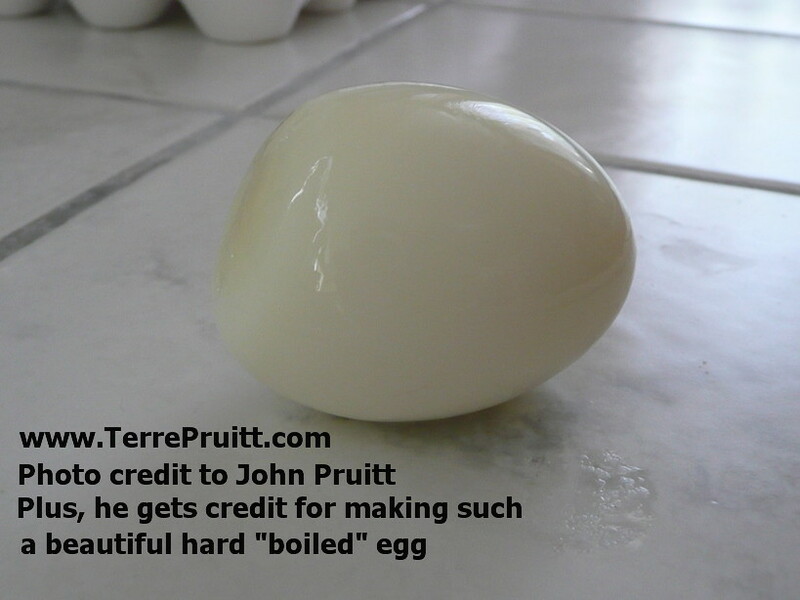 So here is my husband’s method for making hard “boiled” eggs. 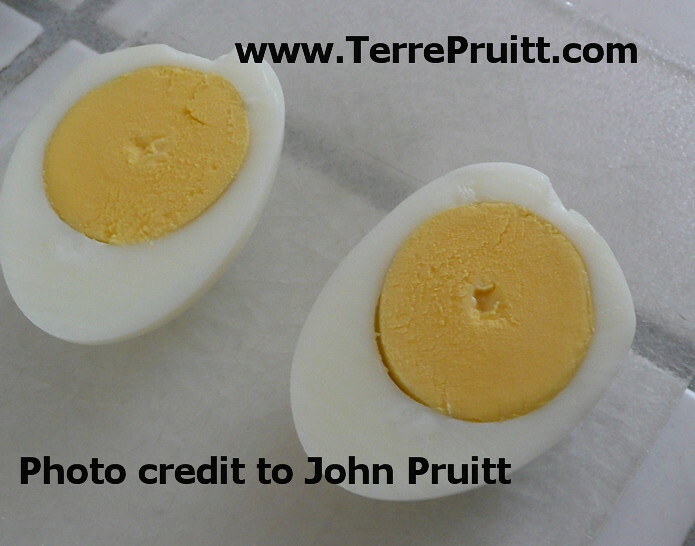 If you are making hard boiled eggs for deviled eggs you might want to turn the eggs on their sides for at least 24 hours. This helps center the yolk so you will have a nicely centered cavity to fill. Preheat the oven to 325°. Wet the dish towel, ring it out. Then spread the towel out over the oven rack. Place your eggs on the oven rack. Allow for space between the eggs. Then bake them for 30 minutes. When the timer goes off, open the oven door and leave the eggs in there for 5 minutes. Fill the bowl with ice and water. 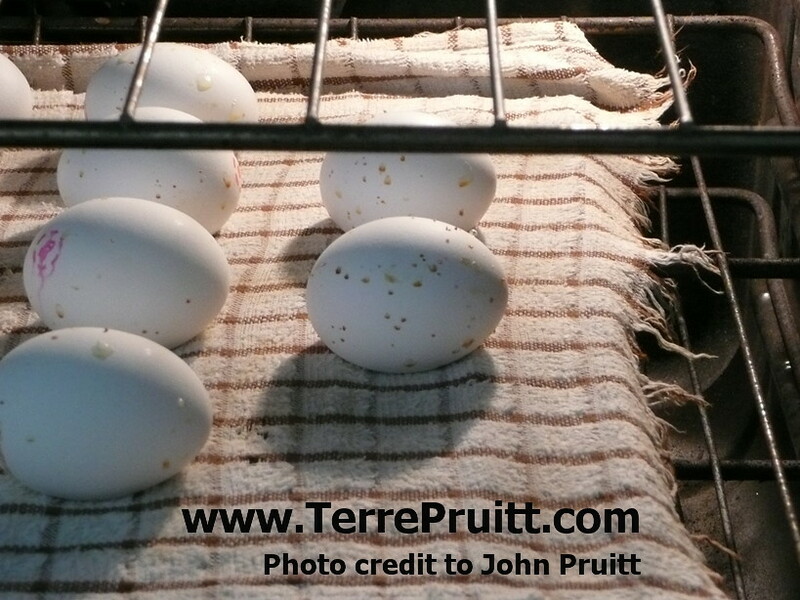 You will notice the egg shells have spots on them. I have not researched this and I don’t know why that happens, but don’t fear my husband said that you can’t really see them on the outside of the egg. He said you have to actually look for the spots to even notice them. He calls them “heat freckles”. 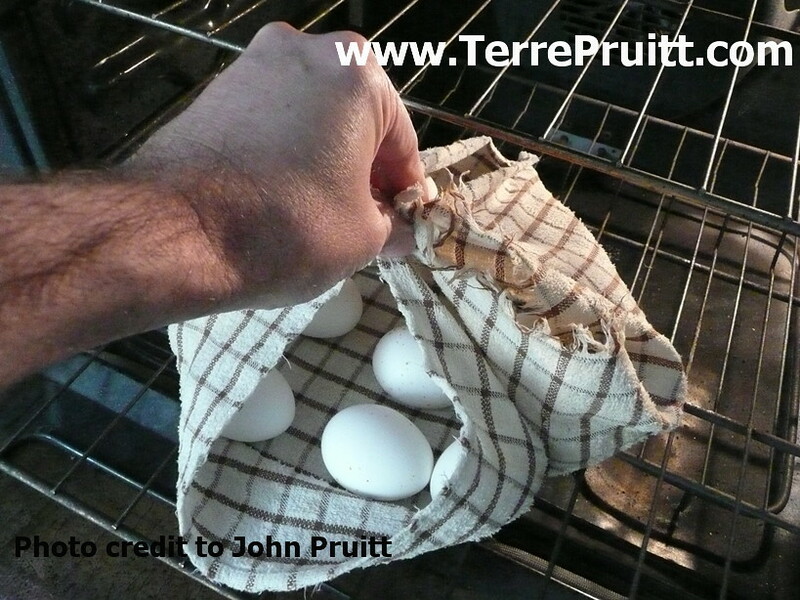 After the five minutes with the door open, VERY CAREFULLY gather up the corners and edges of the towel (using oven mitts if necessary) holding the eggs. Then wet the towel and eggs. 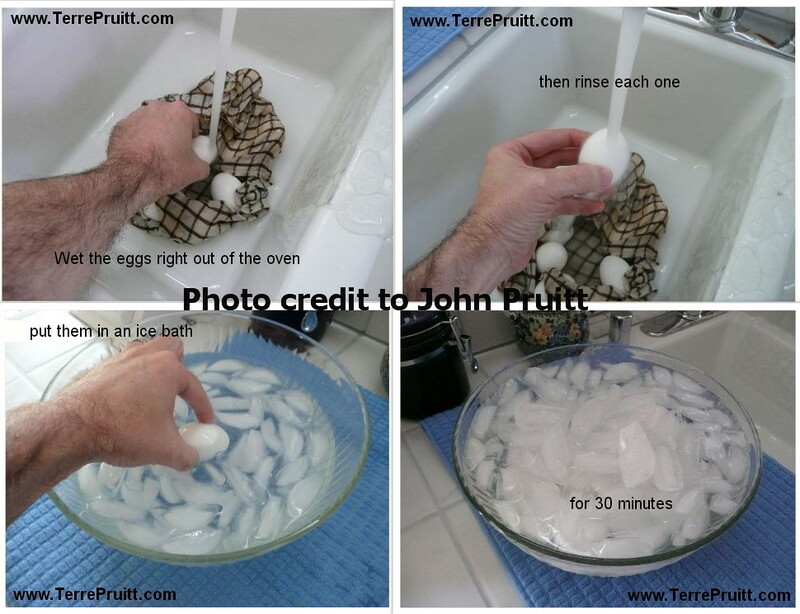 Then rinse each egg and put it in the bowl filled with ice and water. 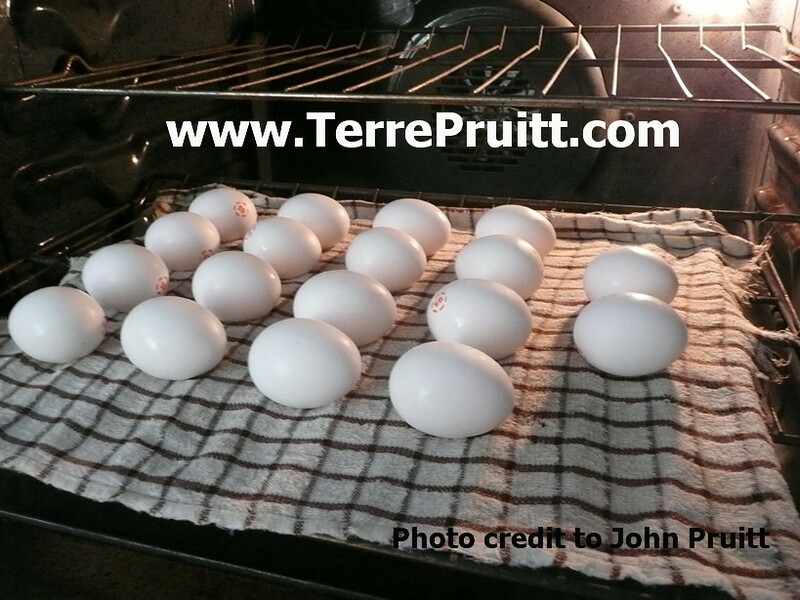 Let the eggs sit for 30 minutes. 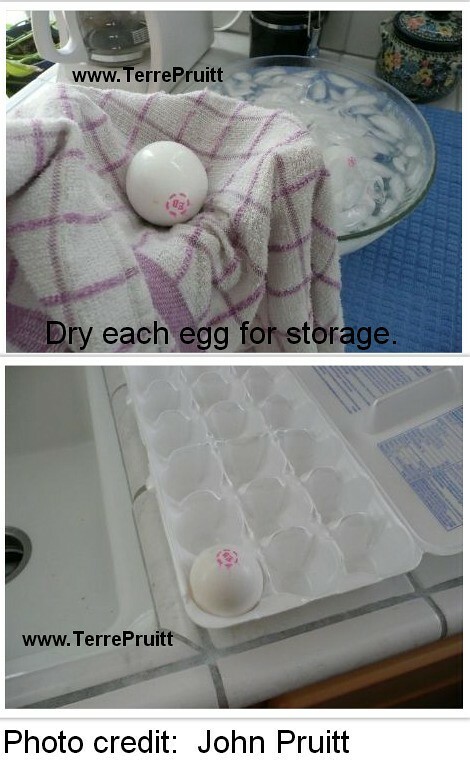 Then dry off the eggs and store them. Or eat them. Or make them into deviled eggs. My husband took pictures of every step. He wanted to show you how nicely these eggs peel. He has had better results, as in easy to peel and quick to peel, with this method than his boiling method. The results are better as are the number of easy to peel eggs. Sometimes there is a difficult one or two, but for the most part they peel easy. I believe he originally saw the wet towel method from Alton Brown. 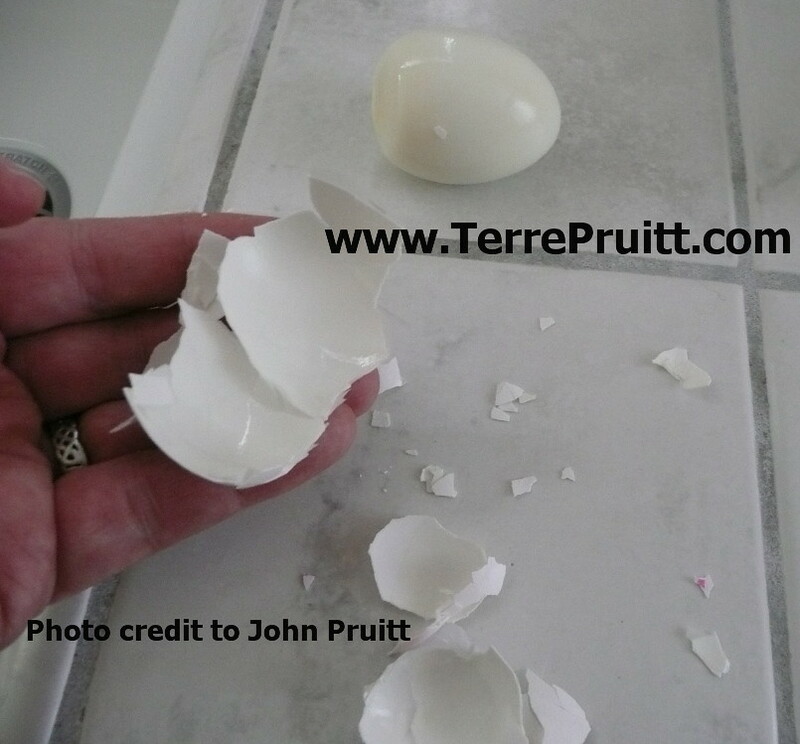 But, as I said, my husband has been working to perfect the deviled egg and he has found that this method of making hard boiled eggs is the easiest because you can easily cook more than a dozen at a time. And they peel really well. 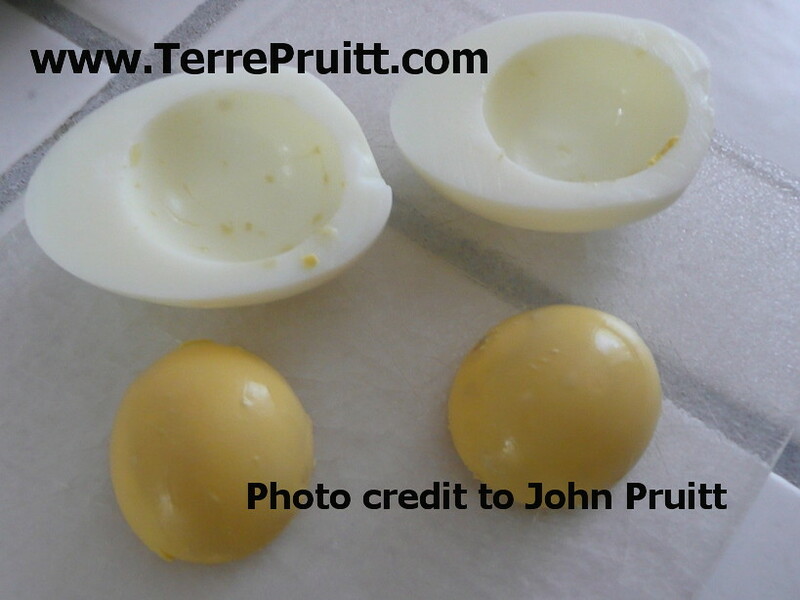 Do you have preferred method to make hard boiled eggs? Any tricks or tips? This entry was posted on August 15, 2016 at 10:17 pm	and is filed under "Recipes", Food. Tagged: Alton Brown, baked eggs, boiling eggs, deviled eggs, easy to peel, Eggs, eggtainer, fried eggs, hard boiled eggs, muffin tine, poached eggs, scrambled eggs. You can follow any responses to this entry through the RSS 2.0 feed. You can leave a response, or trackback from your own site. Has he tried the ice bath after boiling the eggs? I think it’s the shock of the temperature difference that makes them easier to peel. But I did pin a “recipe” about baking the eggs before and wondered if it would really work. Good to know it goes! Yes. An ice bath has always been a step in his methods. And boiling works, but the oven method allows for MORE to be cooked at a time and they have been easy to peel more consistently than the boiled ones. I baked them in a muffin holder, as I said in my post, and that worked fine too. I am also one of those people that have heard about this for years, and said “I should try that” possibly this will inspire me to give it a go…I do love eggs – all kinds of ways! Thanks! Yeah, it was years before I tried it. I actually cannot boil eggs. The few times I have tried — disaster! When John makes deviled eggs he sometimes makes more than a dozen and I don’t think he likes to boil more than 12 at a time. So one day I just baked ’em so he could have that option. He said they peeled GREAT. So next time he made eggs he tried the baking-with-the-towel method.